As you may know by now, CallTrackingMetrics makes it really easy to sync your incoming phone calls into Analytics as Events and then into Adwords as Conversions. We have recently released an update to that integration that enables you to refine your goals to complete just the first time a caller calls– thus avoiding the issue of having duplicate conversions sync into Adwords for the same person that calls multiple times. If you have already set up the integration between our service and Google and want to take advantage of this refinement, you just need to refine your goals in Analytics to only complete/send conversions to Adwords the first time someone calls. To accomplish this, you would just add “first-call” to the Label field. You can keep your other settings the same. 1) First link your CTM account to the correct Google Analytics Profile so your inbound calls start syncing to Analytics as Events. 2) As calls come in, events appear in Analytics. You will see them within the “content” area of Analytics. Notice that each call event now either has “first-call” or “repeat-call” in the label. 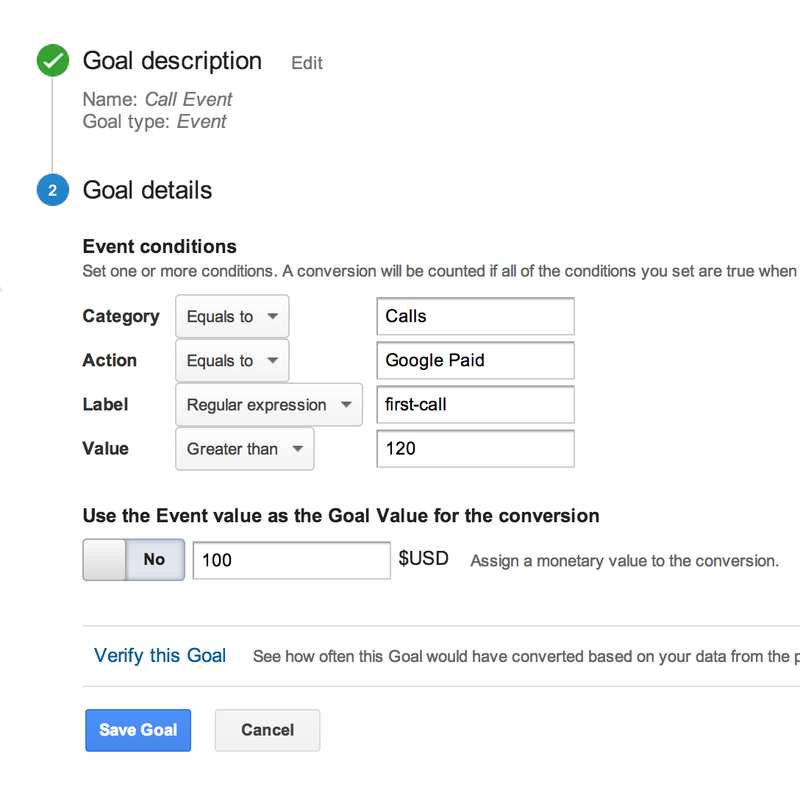 3) Create/modify your goals in Analytics around the calls you want to sync into Adwords as Conversions. For example, if you only want the first call an Adwords caller makes to sync into Adwords as a conversion, you would set up the goal like the example above. The Value Field is the length of the call you want to qualify as a goal completion- you can put any value here you wish or leave it blank. In the scenario above, only first calls over 120 seconds from the source of Google Paid will complete this Goal- but you can leave it blank to have the goal complete for first calls of any length of time. The “Action” field is the “tracking source” in CTM and can be left blank to complete the goal for any inbound call regardless of the tracking source (advertising channel) they call through. Input any specific sources (exactly as they appear in your CTM account) in this Action field to narrow the scope of the goal to just calls from a particular source. Only calls from Adwords visitors will sync into Adwords as conversions, even if your goal is completing in Analytics for all sources. 4) As the goal completes, you will be able to sync the completions into Adwords as conversions automatically. To start that process, wait for your first few goal completions to happen and then in Adwords go to Tools and Analysis—-> Conversions. You will see the “Import from Google Analytics” button light up when its ready to start syncing. After clicking on that, you can choose the type of goal completion you want to sync as conversions going forward. We think this extra refinement will be a useful enhancement for our customers using our Google Adwords integration. If you have any feedback or suggestions, let us know– we’d love to hear it.